90:00+4:09 The referee blows his whistle to end the game. Correction - 90:00+3:16 Steve Morison takes a shot. Save by David Martin. 90:00+3:14 The ball is crossed by Simon Lappin, Steve Morison takes a shot. Save by David Martin. 90:00+2:32 Simeon Jackson produces a cross. 90:00+1:19 The referee blows for offside. Free kick taken by Declan Rudd. 89:07 Steve Morison delivers the ball, Headed effort from inside the area by Simeon Jackson misses to the left of the goal. 88:40 Shaun Williams crosses the ball. 88:16 Corner taken by James O'Shea. 88:02 Adam Smith has a drilled shot. Simon Lappin manages to make a clearance. 85:53 The ball is swung over by Simon Lappin, save made by David Martin. 85:39 Short corner taken by Andrew Surman from the left by-line. 82:05 Inswinging corner taken from the right by-line by Shaun Williams, clearance made by Steve Morison. 81:56 A cross is delivered by Daniel Powell, Simon Lappin manages to make a clearance. 81:12 The ball is crossed by Adam Smith, Adam Drury manages to make a clearance. 80:04 Effort on goal by Aaron Wilbraham from 20 yards. Blocked by Gary MacKenzie. 78:53 Steve Morison is flagged offside by the assistant referee. Free kick taken by David Martin. 78:11 Simeon Jackson produces a right-footed shot from just outside the area that goes harmlessly over the target. 75:48 Substitution (Norwich) makes a substitution, with Ritchie De Laet coming on for Daniel Ayala. 75:48 Substitution James O'Shea on for Sam Baldock. 74:16 Andrew Surman gives away a free kick for an unfair challenge on Luke Chadwick. Free kick taken by Darren Potter. 73:31 Effort from the edge of the box by Aaron Wilbraham goes wide of the left-hand post. 72:09 Shot by Korey Smith from deep inside the penalty area misses to the left of the goal. 70:54 Sam Baldock gives away a free kick for an unfair challenge on Adam Drury. Declan Rudd restarts play with the free kick. 70:19 Substitution (Norwich) makes a substitution, with Simon Lappin coming on for Zak Whitbread. 69:43 Angelo Balanta produces a cross, Effort on goal by Stephen Gleeson from inside the box misses to the right of the target. 69:11 Inswinging corner taken from the left by-line by Angelo Balanta, Russell Martin manages to make a clearance. 69:05 A cross is delivered by Sam Baldock, Russell Martin manages to make a clearance. 68:09 Free kick awarded for an unfair challenge on Dean Lewington by Steve Morison. Direct free kick taken by David Martin. 66:14 GOAL - Daniel Powell:Norwich 0 - 4 MK Dons Goal scored by Daniel Powell from inside the penalty box to the bottom right corner of the goal. Norwich 0-4 Milton Keynes Dons. 64:36 Andrew Surman is penalised for a handball. Gary MacKenzie takes the direct free kick. 63:52 Korey Smith takes a shot from just outside the penalty area clears the crossbar. 62:17 Substitution Daniel Powell comes on in place of Dean Bowditch. 62:17 Substitution Steve Morison is brought on as a substitute for Wesley Hoolahan. 61:06 The referee blows for offside. Indirect free kick taken by David Martin. 59:39 Dean Bowditch provided the assist for the goal. 59:39 GOAL - Luke Chadwick:Norwich 0 - 3 MK Dons Luke Chadwick scores a goal from inside the area to the bottom right corner of the goal. 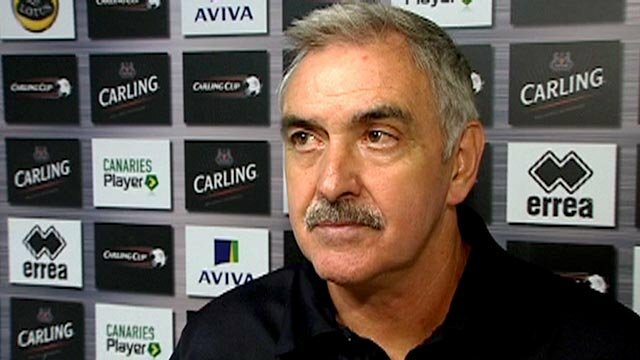 Norwich 0-3 Milton Keynes Dons. 58:53 Russell Martin crosses the ball, save made by David Martin. 56:38 Wesley Hoolahan produces a left-footed shot from the edge of the area and misses to the left of the target. 55:54 Luke Chadwick has an effort from just inside the box that misses to the left of the target. 53:24 Effort on goal by David Fox from long distance goes over the crossbar. 53:15 Korey Smith delivers the ball, clearance made by Adam Smith. 52:22 Inswinging corner taken by Andrew Surman from the right by-line, Close range header by Zak Whitbread goes wide of the left-hand upright. 52:07 Shot from 25 yards from Andrew Surman. Save by David Martin. 49:11 Booking Shaun Williams is given a yellow card. 49:02 Shaun Williams challenges Aaron Wilbraham unfairly and gives away a free kick. David Fox takes the direct free kick. 48:17 Centre by Russell Martin, Shaun Williams manages to make a clearance. 47:09 Long range shot from David Fox misses to the left of the target. 46:29 Wesley Hoolahan fouled by Stephen Gleeson, the ref awards a free kick. Free kick taken by Andrew Surman. 46:03 Shot by Luke Chadwick. Save by Declan Rudd. 45:01 Substitution Angelo Balanta is brought on as a substitute for Jabo Ibehre. 45:00+2:18 The ref blows to signal half-time. 45:00+1:40 Unfair challenge on Wesley Hoolahan by Jabo Ibehre results in a free kick. Free kick taken by Wesley Hoolahan. 45:00+1:24 Free kick awarded for an unfair challenge on Jabo Ibehre by Adam Drury. Stephen Gleeson restarts play with the free kick. 43:18 A cross is delivered by Andrew Surman. 42:44 Andrew Surman has an effort at goal from just outside the area which goes wide of the left-hand post. 41:02 Adam Drury sends in a cross, Simeon Jackson produces a drilled left-footed shot from deep inside the penalty box which goes wide of the left-hand post. 39:57 Outswinging corner taken from the left by-line by Andrew Surman. 39:42 Shot from 20 yards from Simeon Jackson. Gary MacKenzie makes a clearance. 39:08 Sam Baldock sends in a cross, Daniel Ayala makes a clearance. 37:04 The ball is crossed by Adam Drury, save by David Martin. 34:20 Free kick awarded for a foul by Wesley Hoolahan on Adam Smith. Free kick taken by Gary MacKenzie. 31:07 The ball is delivered by Russell Martin, clearance made by Darren Potter. 30:19 Jabo Ibehre takes a shot. Blocked by Zak Whitbread. 30:02 The ball is sent over by Adam Drury, Dean Bowditch makes a clearance. 29:01 Adam Smith takes the chance to get an effort at goal. Save made by Declan Rudd. 27:42 Assist by Stephen Gleeson. 27:42 GOAL - Sam Baldock:Norwich 0 - 2 MK Dons Sam Baldock grabs a goal from outside the penalty box to the bottom right corner of the goal. 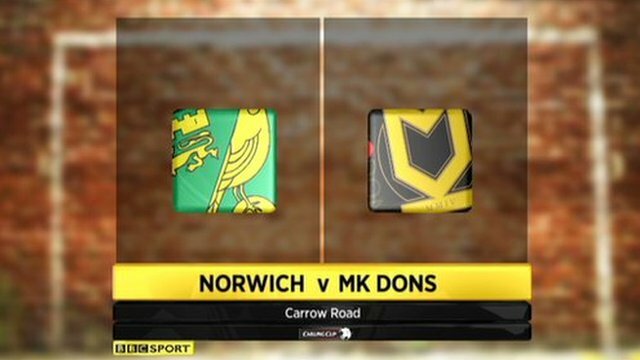 Norwich 0-2 Milton Keynes Dons. 27:17 Foul by Aaron Wilbraham on Adam Smith, free kick awarded. Stephen Gleeson takes the free kick. 26:19 Corner taken by Shaun Williams from the right by-line, Russell Martin manages to make a clearance. 26:14 The ball is sent over by Luke Chadwick, clearance made by Zak Whitbread. 25:37 Darren Potter concedes a free kick for a foul on Andrew Surman. Free kick taken by Wesley Hoolahan. 24:40 Aaron Wilbraham delivers the ball, save by David Martin. 23:55 The assistant referee flags for offside against Aaron Wilbraham. Indirect free kick taken by David Martin. 23:48 Wesley Hoolahan produces a cross. 22:28 A cross is delivered by Wesley Hoolahan, Shaun Williams manages to make a clearance. 20:20 Assist by Darren Potter. 20:20 GOAL - Luke Chadwick:Norwich 0 - 1 MK Dons Luke Chadwick finds the net with a goal from close range low into the middle of the goal. Norwich 0-1 Milton Keynes Dons. 19:10 Darren Potter produces a right-footed shot from just outside the box that misses to the right of the goal. 18:35 Dean Bowditch delivers the ball, Zak Whitbread manages to make a clearance. 15:18 Centre by Andrew Surman, clearance by Shaun Williams. 12:50 Adam Smith crosses the ball, Daniel Ayala manages to make a clearance. 12:33 Zak Whitbread concedes a free kick for a foul on Jabo Ibehre. Darren Potter takes the direct free kick. 12:18 Russell Martin delivers the ball, Shaun Williams makes a clearance. 12:11 Centre by Adam Drury, Shaun Williams makes a clearance. 11:25 Drilled left-footed shot by Sam Baldock. Save by Declan Rudd. 9:53 The ball is sent over by Andrew Surman, save by David Martin. 9:32 The ball is delivered by Russell Martin. 9:23 Centre by Simeon Jackson, Gary MacKenzie makes a clearance. 8:35 Simeon Jackson challenges Gary MacKenzie unfairly and gives away a free kick. David Martin restarts play with the free kick. 6:27 Corner taken by Shaun Williams. 6:06 Inswinging corner taken from the right by-line by Shaun Williams, Zak Whitbread makes a clearance. 6:00 Stephen Gleeson crosses the ball, Adam Drury makes a clearance. 5:53 Luke Chadwick delivers the ball, Russell Martin makes a clearance. 3:00 Dean Bowditch takes a shot. Blocked by Daniel Ayala.